ISO 14001 is a globally recognised standard for environmental management systems. Alternatively, we can also offer preparation support for your EMAS (Eco-Management and Audit Scheme) certification. 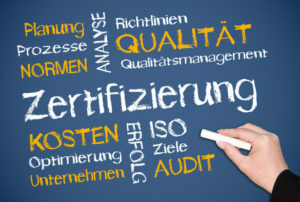 Comprehensive auditing and certification service by Rhein S.Q.M. incl. QM manual, associated process instructions and work orders, forms, environmental planning, materials management and coordination with accredited certification authorities. We guarantee the smooth and successful implementation of all your certification projects. Depending on customer requirements, we also offer continuous support for your business-specific QM systemafter certification. Implementation of your business objectives (e.g. CSR) in terms of environmental and hazardous materials management, compliance with the recognised standard ISO 14001 (alternatively: EMAS) and supplemental customer or legal requirements.